Growth Habit: Boxthorn is an erect, dense woody shrub which can grow to 5 metres high. It has fleshy oval leaves and an extensive root system. Its most prominent feature are the stout spines on all parts of the stem. These spines can be up to 15 cm long on the main stems and are smaller on the smaller branches. Type of plant: Plants are perennial and may be deciduous depending on local conditions. Flowers: White to purple, 1 cm across. Fruit/Seed: Bright red/orange shiny berries full of small light brown seeds..
Dispersal: Seeds are spread by birds eating the fruit and passing the seed some distance away from the mother plant. Seed may be transported in soil on machinery. 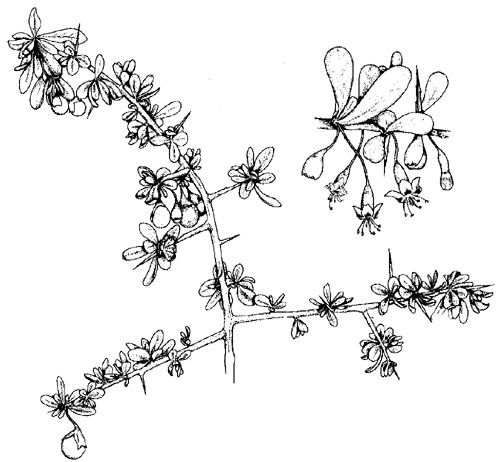 Distribution: Boxthorn occurs in most agricultural areas in Tasmania including King and Cape Barren Islands. Status: Boxthorn is a declared Secondary Weed in Tasmania. It is a Declared Noxious Weed in all mainland states and territories. Boxthorn is capable of invading waste areas and neglected pastures reducing access for mustering, maintenance works and watering of stock. The spines can cause damage to pneumatic tyres and injure animals. Plants provide excellent cover for rabbit warrens. Boxthorn hedges require regular maintenance if they are to be confined to a manageable height and width. Even hedges that are clipped regularly will produce flowers and fruit on the older wood. Birds will then spread the seed further. Troublesome insects including fruit fly and the common house fly breed on the plants and rotting berries. The plant is thought to be poisonous though it is rarely grazed due to the number and sharpness of the spines. Boxthorn has been used in Tasmania as a hedge plant on rural properties since the mid 1800’s. It forms an impenetrable barrier to all farm animals including poultry. Because of it dense growth and hardy nature, it is a very effective windbreak plant. It provides excellent protection for native animals and birds that may be vulnerable due to the absence of native understory species and the increase in dog and cat numbers both feral and domestic. For further information on Boxthorn, contact the Department of Primary Industry, Water and Environment, Tasmania (Declared Weed Leaflet, A/W21 (9/1988). Grubbing (all year). Small plants can be dug and removed. The area should be monitored for regrowth from root sections or germinating seedlings. Heavy machinery is effective on large plants. Removed material should be destroyed. Establishment of vigorous pasture or crop after cultivation can minimise reinfestation due to competition. Herbicides (spring, summer and autumn). African Boxthorn can be treated with several herbicides including glyphosate, triclopyr and a triclopyr/picloram mixture. Foliar, Basal and Cut Stump treatment are all effective methods for African Boxthorn. Contact D.P.I.W.E. for further information. Burning (all year – subject to fire restrictions). Burn when dry. N.B. Bushes that have been chemically treated may be resistant to burning.